1. The "MIDNIGHT MADNESS" ("the Promotion") is available to all Bluesky Cook Islands WiFi customers ("the Customer"). 2. The Promotion will run for only a limited time from 1PM-2PM on Thursday 10 May 2018 ("the Promotion period). Once activated, the Promotion starts from 12 AM Friday 11 May and ends at 5:59 AM Friday 11 May. 3. 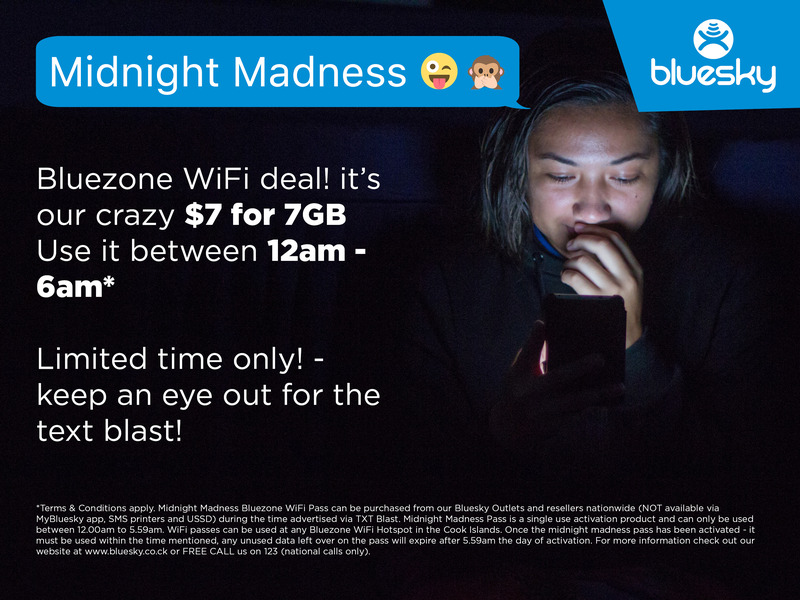 To enter the Promotion, the Customer must purchase the 7GB Midnight Madness WiFi voucher valued at $7.00 from any Bluesky outlet or reseller within the Promotion Period. This applies to all customers NATIONWIDE. Promotion is not available from myBluesky app. 4. Upon purchase, the customer will be presented with a Bluezone WiFi voucher entailed with login details and the password to activate the session. 5. Upon activation, the customer has until the end of Promotion Period to use the total value of the Promotion. Any remaining usage cannot be used for further browsing and will expire after 5:59 AM. 6. Customers are not limited to the number of purchases of the Promotion. 7. Each purchase is a single use only and will expire at the end time of the Promotion Period. 8. Vouchers can only be used at Bluezone WiFi hotspots. For a full list of our Bluesky Bluezone Hotspots see here.